Day of the dead is a Mexican tradition that remembers and celebrates those who have passed away. 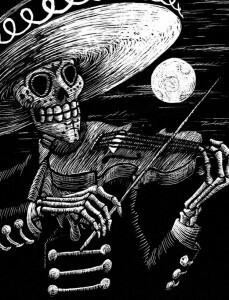 El dia de los muertos is celebrated on November 1 & 2 of each year. On the 1st of November “el dia de los innocentes” or the day of the children is celebrated and on the 2nd of November celebrates “el dia de todas las almas” or all souls day. 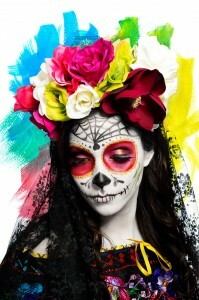 Makeup inspired by “sugar skulls” is worn by women and some men. The makeup consists of using bright colours, distinctive floral patterns and miscellaneous shapes to honour their loved ones. As part of this tradition, Mexican’s believe their loved ones spirits return. Those who are living place offerings at the cemetery or alter (created in an empty room in the home). Offerings such as the spirits personal belongs, favourite food, beverages, cigarette or toys for children. This gives a time for the living to share these items with them. Other items such as photos, wreaths, crosses, candles, flowers (marigolds) and pan de muerto (bread of the dead) are also used. It is believed, the spirits need food and light to guide them. The offerings are also suggested to represent four elements earth, wind, water and fire. To celebrate El dia de los muertos at Fiesta we will be offering a special cocktail called Citrus Ofrenda (citrus offering).